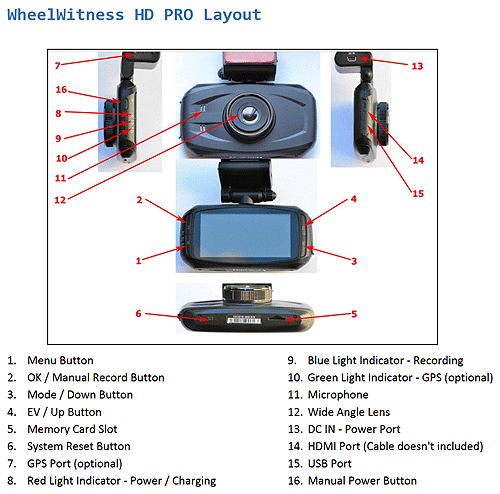 [Review] WheelWitness HD PRO Dash Cam - Worth the price? 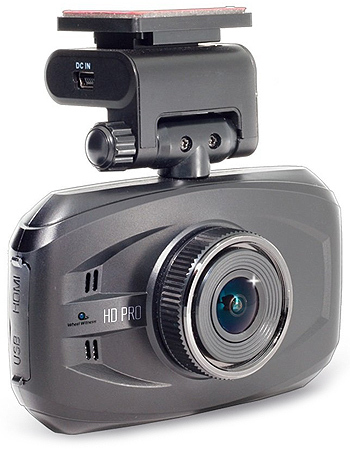 Wheelwitness’ HD Pro Dash Cam claims to have a 170-degree lens, provide driver assistance, and contain a night-vision feature. My first impression was that it looked like a pretty normal dash cam. After dealing with cheaper and lower-quality dash cams for a while, I decided to put this one to the test. This camera seems a bit pricey in my opinion, but I took the bait and tried it out. The box contains the camera itself, the user manual, a suction cup mount for car attachment, a GPS, two sticky mounts, a micro USB cable, a 12-foot power cable, and it even came with a 16-gigabyte micro SD card! 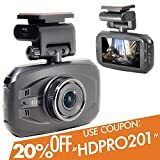 Most dash cams I have used do not come with an SD card, so this was a pleasant surprise for myself and probably any new dash cam owner as well. Depending on what video size you select, the camera will record at specific intervals and save those on the camera. For example, if you choose the five-minute setting, the camera will record in five-minute intervals and save each of those files onto the SD card. Once the SD card is full, it will delete the oldest files and replace them with new recordings. This is a pretty convenient feature, but I still think it’s a good idea to back all your files up onto a computer just in case. The video quality is a lot different than I was expecting. A lot of other cameras are only 120 or 140-degrees wide, but this camera truly feels like it’s 170-degrees. Like the product description says, you really can see into the lanes to the left or to the right of you if you wish. Being that the camera was so small I thought it was just a gimmick, but it really does work well. I tried it in daylight, cloudy weather, rain, night, and fog and with a bit of adjusting, I got great results from each one! The video records at a full HD 1080p video at 30fps with H.264 compression technology. Supposedly there is a 60 fps option but I have not found anything it so far. Since I have dealt with cheap cameras in the past I am very familiar with the MPEG format. Let’s just say that I am happy that they went with H.264. The camera is great, but the part that surprised me the most was the GPS. The sound is pretty standard, nothing much to report here. I tried the camera out for a while before writing this review, so naturally, I was exposed to lots of different volume levels throughout my rides. I was surprised at some of the quiet things it picked up! Also with cheaper cameras, the sound was often a bit choppy and could not handle loud sounds, but I experienced a lot fewer of these problems with the sound on this dash camera. In my opinion, the GPS is the real MVP of this dash camera. I have not had any GPS functionality in my other cheaper dash cameras, so when I found the GPS sensor in the box I was thrilled to try it out. The GPS not only records your location in real-time but it also monitors your speed, bearing, and altitude and puts it right into the video! I had no idea that the GPS was capable of that. I think this feature will definitely come in handy in many instances. They even have their own software that you can run on your computer that will map out your entire journey with the speed and other statistics included. A few other things that I like about this camera are some extra features that enhance your ride. I drive an older car so it does not have a lot of safety features the newer cars have. The dash camera will make a sound to alert you if you are getting into another lane, which came in handy during long highway drives. It will also alert you if the headlights are not on. I usually don’t forget to turn on my lights so this was not used very much, but I can see how this would come in handy. It also has a function that detects shock. If this is triggered, it stops the recording and prevents the footage from being overwritten, which is an amazing idea and could be very important in a court case. All in all, I think that this camera is very well worth the price! A lot of times, you pay for what you get. Dash cameras are no exceptions to this rule. 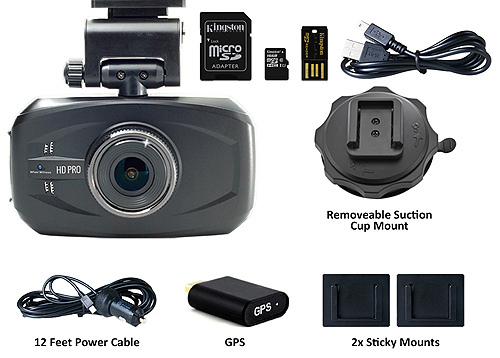 What you will find that sets this dash camera apart from many of the others in this price range is the 170 degree angle lens, which gives you far more coverage and field of view then most dash cams. The adhesive mount is also a plus. 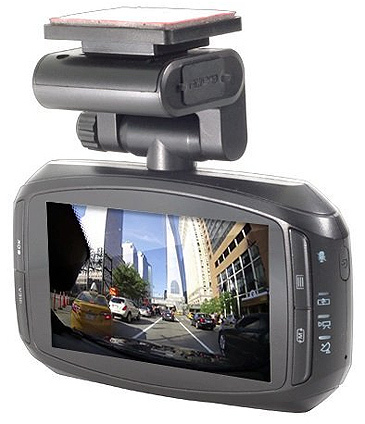 Most other rectangular shaped dash cams that have a similar body style will often have a suction cup mount. Although suction cup mounts can be nice if you plan on switching the camera from car to car on a regular basis, they are prone to falling off and I personally prefer to have an adhesive mounted cam because of this. Given this cameras price, field of view with its wide lens angle and other features, I would say it’s worth giving it a try.